Queen and Adam Lambert have added two shows to their fall tour of South America. In addition to headlining the opening night of Rock in Rio on September 18, the band will also perform in São Paulo (Ibirapuera Arena) on September 16 and Porto Alegre, Rio Grande do Sol (Gigantinho Arena) on September 21. 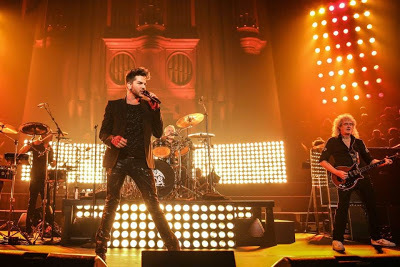 "I'm so excited to be joining Queen for these dates,” adds Lambert. “This will be a triumphant return for them, and my FIRST time in South America!" Ticket details will be announced soon and further Latin America dates are expected to be scheduled. Part of Rock In Rio’s 30th anniversary series, Queen’s appearance marks the band’s return after opening the inaugural event in 1985 with original lead singer Freddie Mercury. Queen’s opening night on January 11, 1985 at Rio’s custom built City of Rock exploded the record books, drawing an audience of over 250,000. The band’s second appearance on January 18 brought their total Rock in Rio audience beyond 500,000. Televised to over 60 countries across the world, Queen’s shows were watched by nearly 200 million people. Queen albums occupied all top ten places in the Brazilian album chart and “Love Of My Life” became a new Brazilian anthem.